I absolutely fell in love with the idea of roasting strawberries with basil long before I even took the first bite. Because after 30 minutes in the oven, my kitchen smelled amazing. My mother-in-law once served us cheesecake drizzled with basil syrup for dessert. Back then, the idea of basil going anywhere near something that wasn’t tomatoes and mozzarella was completely a foreign concept to me. And that, of course, meant that I was first in line to snag a slice. But it really works perfectly with strawberries, and much better than mint, if you ask me. Cooking the strawberries concentrates the flavors and softens the berries, leaving them with a texture similar to thawed, frozen berries but a taste 1000 times better. Cooking them with basil and pairing them with tangy goat cheese on a crispy slice of toast? The basil and goat cheese cut the sweetness of the berries, lending it a more savory bite. It’s an appetizer perfect for a summer dinner party. 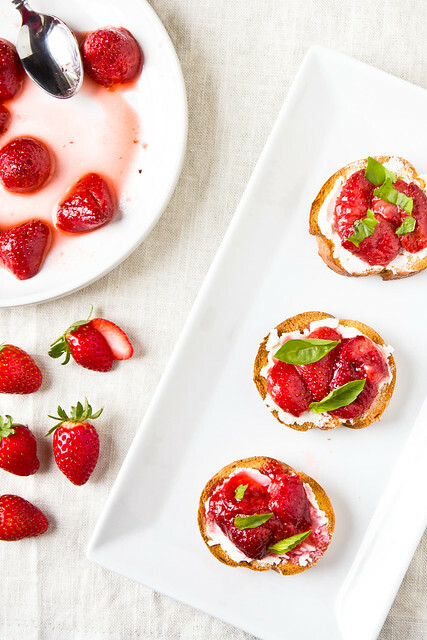 Basil, goat cheese, and roasted strawberries offer a savory twist to this strawberry appetizer. To make the basil syrup, heat water and sugar in a small saucepan until hot and remove from heat. Add basil leaves and let sit 15 minutes. Discard the leaves. To roast the strawberries, heat the oven to 300. Place the strawberries into a small baking pan (I used an 8x8) and pour the basil syrup over top. (I used medium strawberries, if yours are very large, consider cutting them in half). Roast for ~1 hour, until the berries have softened. Remove from the oven and set aside. Drizzle the baguette slices with olive oil and bake 5-7 minutes, until golden brown. Remove from the oven, and while still warm, spread with goat cheese. 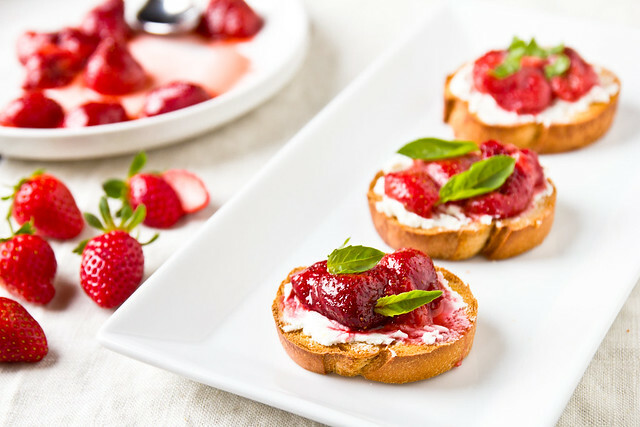 Use a spoon to break up the berries a bit, and then scoop a spoonful onto each crostini. Drizzle with additional basil-strawberry syrup. Garnish with small basil leaves and serve. Leftover basil-strawberry syrup will keep up to a week in the fridge - it's wonderful over yogurt and ice cream. What a perfect little bite. I love the combination of strawberry and basil. Mmm these are so pretty and easy! Great for entertaining! That does sound great! I have roasted peaches with basil before and loved them. I don’t know why I haven’t tried strawberries yet! I made a strawberry salad with basil, roasted asparagus, goat cheese, and a balsamic reduction last year…and it was kind of hte best thing ever. This is going to be the new that. I can feel it. I sooooo need to make this! If my family is lucky, I might share with them… but, then again, maybe not! They look so wonderful! These are beautiful. And I’ll bet they just taste amazing! Looks like small candies. Must be sweet and tasty. These look yummy! I just planted our basil yesterday – so this will definitely be on our list when we have friends over! Shawnda, these look so mouthwatering! 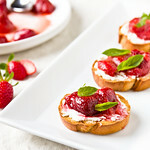 What a creative recipe for bruschetta on the sweet side. I would have never thought to do this but will definitely think to prepare bruschetta this way next time! Yummy – I’ve never thought to put goat cheese with strawberries, but this looks scrumptious! I made these as an appetizer for our Mother’s Day dinner last night, and they were a huge hit – everyone loved them! Thanks for the recipe – I’m sure I will be making it again soon!